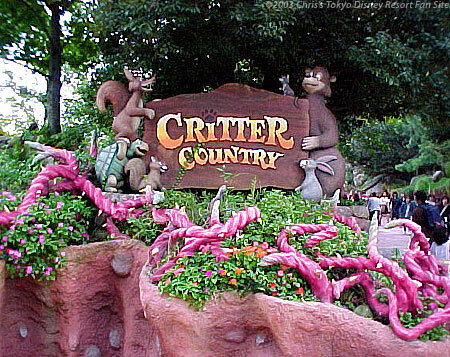 Although Critter Country is the smallest land at Tokyo Disneyland, it's one of my favorites. Tokyo Disneyland is, of course, a "theme" park, but designers went above and beyond the call of duty in creating the beautiful and rustic scenery Critter Country has to offer. Subtle and elegant design touches are everywhere, some integrated into the attractions, restaurants and shops, and some standing on their own. It also helps that Critter Country is located next to Tokyo Disneyland's picturesque Rivers Of America. While Critter Country is small, it's home to one of Tokyo Disneyland's biggest attractions: Splash Mountain. Not only is the attraction itself big, but its impact on Critter Country is big as well, as queue lines wind through and take up a big chunk of Critter Country's limited real estate. Splash Mountain is unquestionably Critter Country's most prominent feature. Most people assume Critter Country ends at the entrance to Splash Mountain, but if you take a left turn and go under the railroad tracks you'll find the Beaver Brothers Explorer Canoes and the offbeat Rackety's Raccoon Saloon, plus more beautiful landscaping. Even if you're not going to ride the canoes, I highly recommend you take the short walk to this area of Critter Country just to view the rustic scenery.